The 3G-SDI 4 In 4 Out Switcher and Splitter allows you to input up to four SDI, HD-SDI and 3G-SDI signal sources, such as SDI video cameras/recorders, to be shown on up to four SDI displays, such as a SDI computer monitor. This device performs both functions of splitting the signals without loss of quality to multiple screens as well as allowing the user the freedom of being able to switch between up to four separate input sources. The switcher/splitter has a high bit rate of 2.970 Gbit/s which ensures to give you a fast signal transmission without loss of quality. For professionals this means that it is now easier to switch four 3G-SDI signals and split it up to four SDI signal outputs. This device has a number applications for both professional and amateur camera work and display, including video broadcasting on single or multi-display, professional video program on single or multi-display, film studios program monitoring, and video program switching on single or multi-display, etc. 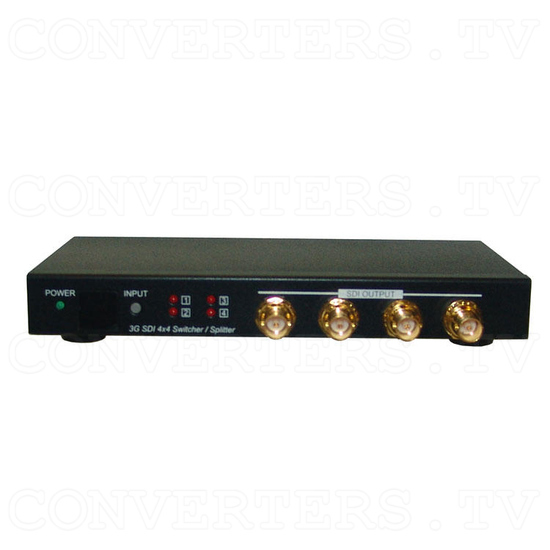 Installation and operation of the 3G-SDI 4 In 4 Out Switcher and Splitter is very easy and simple. All input/output ports are clearly labelled. LED lamps identify the selected SDI input and the power on/off status. Input selection is made by front panel push button, or hand-held remote control. RS-232 interface allows for easy PC control of the devices functions. Power requirements supplied by 100-240vAC to 5vDC 2.6A Universal power adapter. To use simply connect four separate 3G-SDI signal sources to each individual input of the device and from each 3G-SDI output connect to an individual SDI display. The selected input is now displayed on each SDI monitor. Extension of the SDI signal path via the device can be achieved by connecting any of the SDI outputs with an SDI extender or converter. The 3G-SDI 4 In 4 Out Switcher and Splitter allows you to input up to four SDI, HD-SDI and 3G-SDI signal sources, such as SDI video cameras/recorders, to be shown on up to four SDI displays, such as a SDI computer monitor. This device performs both functions of splitting the signals without loss of quality to multiple screens as well as allowing the user the freedom of being able to switch between up to four separate input sources. 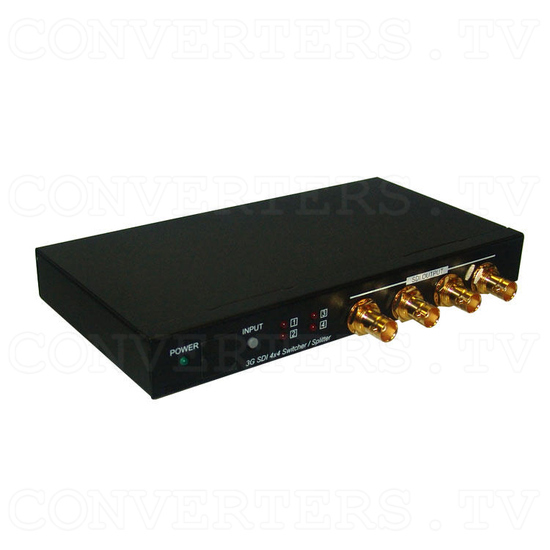 The switcher/splitter has a high bit rate of 2.970 Gbit/s which ensures to give you a fast signal transmission without loss of quality. For professionals this means that it is now easier to switch four 3G-SDI signals and split it up to four SDI signal outputs. This device has a number applications for both professional and amateur camera work and display, including video broadcasting on single or multi-display, professional video program on single or multi-display, film studios program monitoring, and video program switching on single or multi-display, etc. 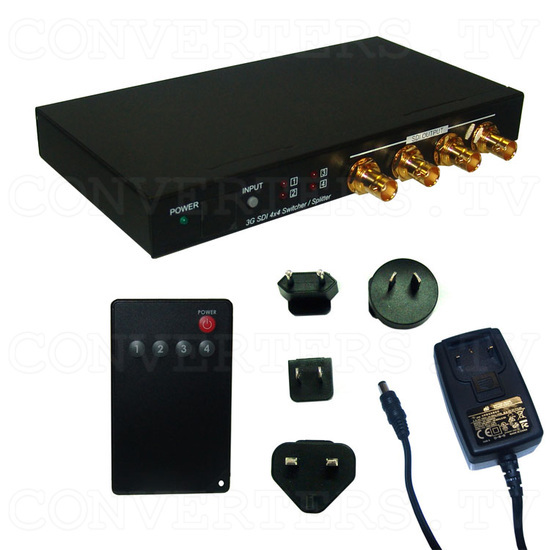 Installation and operation of the 3G-SDI 4 In 4 Out Switcher and Splitter is very easy and simple. All input/output ports are clearly labelled. LED lamps identify the selected SDI input and the power on/off status. Input selection is made by front panel push button, or hand-held remote control. RS-232 interface allows for easy PC control of the devices functions. 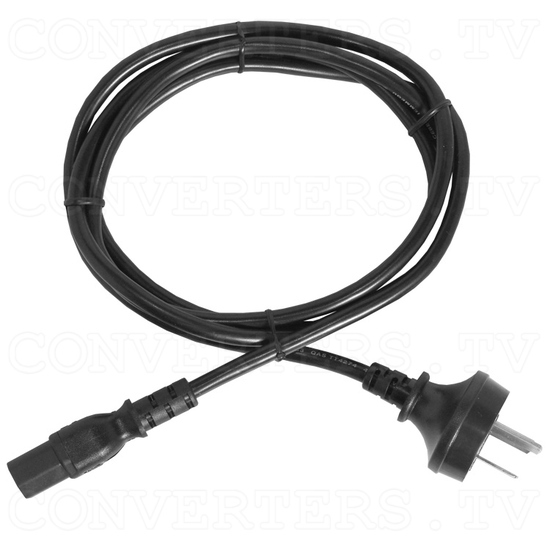 Power requirements supplied by 100-240vAC to 5vDC 2.6A Universal power adapter. To use simply connect four separate 3G-SDI signal sources to each individual input of the device and from each 3G-SDI output connect to an individual SDI display. The selected input is now displayed on each SDI monitor. Extension of the SDI signal path via the device can be achieved by connecting any of the SDI outputs with an SDI extender or converter. Supports signal input and output distance of up to 300M for SD signals, 200M for HD signals and 100M for 3G signals.